The Old Norse runes, known as the Elder Futhark, have long joined forces with the cycles of the seasons to offer powerful initiations, guidance, and wisdom. Aligning the sacred festivals, plantings, and harvests of ancient runic calendars with our modern 12-month calendar, Kelley Harrell reveals how the runes can once again offer initiations as well as instruct us on the holy days and creative rhythms of today. Drawing on her more than 25 years of shamanic practice and runic study, Harrell offers a step-by-step primer to work with the runes throughout the year. She explains how the 24 runes of the Elder Futhark follow a seasonal progression in which each stave rules the calendar for a half-month. 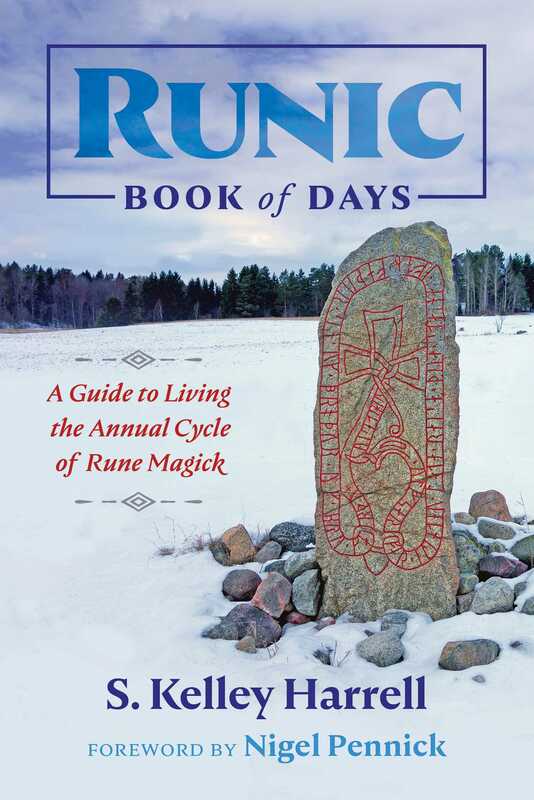 She explores the meaning of each rune in detail and presents structured runic devotionals for each half-month, interwoven with guidance on how to make the best use of the life force available during each season, as well as runic initiation rituals for the 8 pagan Sabbats, or holy days, such as the Summer Solstice (Litha) and Beltane (May Day). She details the runes most powerful during each half-month, what they portend for personal and spiritual wellbeing, techniques for creating relationships with them, and how to work with them as an oracle. The author also explains how the runes leading up to each Sabbat help create the space for properly greeting each calendrical transition and completing its initiation. By moving through Nature’s cycle with the runes, each year becomes a reliable and trackable process of personalized growth and spiritual connection. Progressing through the teachings of each stave while honoring the seasons, Harrell’s year with the runes becomes an initiation into a direct relationship with powers of Nature. In the previous half-month Fehu taught us much of personal prosperity and the commitment required to sustain it. As we move into Uruz, that commitment deepens. Uruz represents Auðhumla, the feminine divine in the guise of the auroch--the wild ox. This stave--and in turn this half month--focuses on the body, well-being, and wild potential. It’s curious that, in the runic ordering, we are given the opportunity to learn how to tend our wealth before we encounter actual creation. We’re given instruction on how to sustain, through Fehu, before we’re fully manifest. If that isn’t a significant hat tip to the importance of duty in earthly life, I don’t know what is. As Uruz is associated with Auðhumla, it’s a significant force of creation. Because there’s no indication of how she originated, she’s seen as having created herself. She’s seen as eternal, thus sustaining in her support of us. With Uruz, we are such infinite mysteries as well. Our short time with her brings an important observation of vitality. In this season we have the opportunity to make use of our faculties to our highest capability and have the support of an omnipotent force while we do so. This is a natural time to expect and find physical support. It’s a time that the body’s ability to self-heal is exalted, and any changes we implement toward that goal will be fortified by the elements. With the associations of Auðhumla creating herself into form, Uruz is very much steeped in all things body and sexuality. By form being our most evident state of self, we take for granted that we know our bodies. Even from a spiritual standpoint, we sometimes passively deny our physicality in favor of our souls. If we sit with that, take on honoring the self, we discover that the part of ourselves we least often know isn’t the soul, but our body and its most powerful consciousness counterpart--our ego. When we sit in ignorance of the ego, we sit in ignorance of Shadow, which is our greatest mystery. Where Fehu represents domesticated cattle, Uruz is the wild, untamable auroch, and as such, brings us close to parts of ourselves that we’ve been taught to subdue, if not subvert. More dominant and demanding than feelings, unconscious motivators are usually internalized before we’re even verbal. They express as Freudian slips, acting without clear motivation, acting without realizing the action, irrational fear, and so on. Uruz brings our attention to these seemingly minor behaviors as places to generate radical change. When we become consciously aware of them, thus take back control of them, we integrate them into informed choice. We stand with more information and can focus the energy and change we want to make in our lives and the world. We do that by engaging Shadow. Shadow is our greatest intrigue, not because it is unknowable, but because we most often desire not to know it. We evade working with it because it seems frightening, or it may reveal aspects of ourselves too dark for us to handle. In reality, Shadow is merely what isn’t lit. It’s what we don’t know about ourselves. Once revealed, it’s no longer Shadow. Uruz harnesses the ability to sit in the space between knowing impeccably who we are, and having no idea. It fosters our ability to dwell in our thoughtspace and create ourselves as we want to be, which is born of learning who we’ve been. This stave is wild potential, magick at its rawest. Bear in mind Uruz is the creative force, not what is created. For this devotional, find a quiet, dark indoor space that supports a still mind. Gather fetishes-- items of meaning and power--to place about the space as you relax. Turn off the phone and the television. If appropriate, cover your eyes with a scarf to blot out distraction. Close your eyes and imagine comfort in the darkness that greets you. In the furthest reaches of your imagination, wrap snug in that darkness. Allow nothing else, for now. In this safe, hallowed space, invite in the aspect of you most needing your attention. Still focused only on the darkness, honor this part of you. Welcome it as you would a long-lost loved one. Bless it as you would someone who has given you the best news, ever. Forgive it passionately as you would someone who harmed you, yet you desperately love. Ask it to forgive you, as you would someone you hurt terribly, who needs you to see your integrity. Express love to this part of you, heartfelt, pure. Finally, receive it as you would the best gift on your favorite holiday. Let this aspect of you ease into your senses. Observe how it feels, how it appears. Remain open to what it needs to convey to you, and allow the depth of exchange necessary to listen and be heard. If healing is needed for either of you, call Auðhumla in to facilitate that rite. Honor her presence, and ask her for the healing that’s needed. When it’s done, ask how to maintain that healing. Be sure to thank her, and ask what offerings you can make on her behalf. I am free to be. S. Kelley Harrell has worked with the Elder Futhark runes for over 25 years. A lifelong intuitive and ordained interfaith minister, she holds a master’s degree in Religious Studies and has been a practicing shaman since 2000. Her shamanic practice is called Soul Intent Arts. The author of Gift of the Dreamtime and Teen Spirit Guide to Modern Shamanism, she lives in North Carolina.